We are Under the Weather today - both literally and figuratively. It's a cold, rainy, gray, dark, nasty day and Scott woke up sick this morning and has stayed home from work and I went to Bible Study and came home feeling bad. We all three have been asleep for a long nap this afternoon and I just woke up. I'm pretty sure we will all go to bed early tonight and I'm going to hope Harper stays healthy. YUCK! I have sunshine on a rainy day though because Harper went to the nursery during Bible Study and did SOOOOO good! She smiled and didn't cry the entire time. The wonderful workers said she did just great and when I picked her up she was SO happy and just smiley all the way out to the car and she just talked and babbled all the way home. And she has taken a really long nap so it must have worn her out. I'm so thankful - maybe she will start doing good! She's also smiling because she slept ELEVEN straight hours last night!!!!! WHOOOO HOOOO! So not much of a post today - just wanted to say hey! Thanks for all of you OBU'ers coming out of the woodwork yesterday. I need to share with you that if you have recently had a baby or about to have a baby - make sure and contact the alumni office and let them know and you WILL get one of those OBU shirts. They are 12 months so if you missed it - they are sorry but if your child is younger - get moving and you will be in the OBU circle and get that fabulous shirt. I'm turning anonymous comments back off. I was so happy to hear from so many of you (and I bet you were glad to find each other) but I remembered why I keep anonymous comments turned off and if you have a blog - you probably should too. This is my personal blog that I write for the benefit of my family mostly. I know that there are a great number of people out there who may not like me or may not agree with me on things. And that is fine - I don't blame you. But it's not necessary to leave ugly comments and hide under anonymity. It's best just to not read my blog and find one that you DO like and agree with! I'm not perfect - I'm a big mess so I will do things that everyone doesn't like - but that's okay. That's just me. Hope you guys all start feeling better soon! It is no fun to be sick nor to have a sick baby! Hope you all feel better and that little Harper doesn't get sick. I agree with you that if someone doesn't like what you say or do, why in the world do they read it then make ugly remarks. Sounds like they need to get a life. Maybe we should pray for them. Hi. Sorry people left you nasty comments. I don't get why people read the blog if they have so many negative feelings about it either. Anyway, I live in Colorado and I didn't comment the other night... so I'm thankful for... grace. Geesh, I've needed it lately- especially from my 4-year-old! So, I've been wondering... back to that post about regional differences (except its not really food)... is the monogramming a southern thing or just something you like? Sorry you're all sick :( I had my bout with it about 2 weeks ago. Yuck! Feel better soon! Feel better, Kelly! I think you are absolutely fantastic and your blog keeps me going through some really tough days. Don't ever let those people keep you down! Awww, hope you all feel better! I'd love to have that rainy weather here! We are prepping for our BIG 12 game this Saturday down in Austin. I know you are an SEC fan, but we love our BIG 12! GO TEXAS TECH! Hopefully it will be another great weekend of college football. Get well soon! I just went back to read those anonymous comments...cause I'm nosy like that! ha! But, how stinking rude?? That makes me sad. Hope you guys get to feeling better!!!!!!!! Hope you guys start to feeling better soon! Last week it was rainy here in Texas and I didn't feel too good either! I have not slept through the night since my first was born, 4 years ago..how do you get her to sleep so long?!?!? Great blog, love the prayer section. Goodness Sakes! I can't imagine anyone not liking you! I think you are absolutely the most charming person I have ever "met". I'm so sorry you are having to deal with such meanness. I hope you feel better soon. Have a great day!! I hope you all get feeling better. I love what you do and your attitude toward the situation is great! Thanks! Hope you all feel better! We live here in NW AR, and my oldest 2 girls (8 and 5) missed school yesterday and today with stomach flu and fevers, but the good news is my 3 year old hasn't come down with it. If disinfectant works, we should be in the clear around here for the next decade! Hope sweet little Harper stays well. Hope you and you fam feel better soon! I love your black/white/green diaper bag (in a picture from your vaca). Will you share you got it? Thanks! Kelly, I'm sorry ya'll aren't feeling well. I hope you feel better very soon. Also sorry that people leave ugly comments, what is it with people. I think we should pray for them, they are obviously miserable. I LOVE the dress that Harper has on, can you share where you got it? Hope you guys feel better! I am hurt that someone would leave you a mean comment....anyone at that. (I read one and it brought tears to my eyes) I pray they will understand that some things are better left unsaid and are hurtful. You are an amazing woman! Let it roll right off your shoulders (which I'm sure you did). That dress Harper is wearing is too cute! Ugh! Why do people leave mean comments? I've almost stopped reading comments on all blogs, even when I leave one, because I can't stand it when someone is mean. It hurts me so much to read that, and I can't imagine what it does the blogger that they are leaving it for. You are lovely and have a lovely family. Don't listen to those mean-spirited people. Hi Kelly. I hope you and your husband feel better soon and I hope Harper stays nice and healthy. I went back to read some of the anonymous posts but you had already deleted them I did see one where someone made a comment about not liking Harpers huge bows. I LOVE THOSE BOWS so keep them coming. I also don't think you are a mess. I think you are adorable. Feel better soon. These annonymous commenters need to lay off the haterade! Hope you and Scott feel better soon, my sweet friend! So sorry that you are feeling bad! I am praying that you feel better soon and that Harper stays well, so glad she liked the nursery today and hooray for sleeping through the night!!!! Hope you're feeling well soon. Its the pits when one family member gets sick, and then the next one, and then the next one, so I really hope this doesn't happen to you all. And it makes me so sad,every time you apologize for something on your blog, or have to remind people that if they don't like what they read here, there shouldn't read. That's such a bummer. We love you and your blog. My boys enjoy all of the videos of Harper, especially the "raspberries" from a few months ago. Hey girl! Amen to what you said about anonymous comments! That really gets to me when they do that so that is why I also turned them off. People can be so rude and nasty! I think everyone in the world around here is sick too! I just got over mine- finally- knock on wood- but it's running its course everywhere! Kelly, I think you are doing an awesome job! Don't let people put you down, but you are right, if they aren't happy (not sure how that could be) with what you have to say then just don't read your blog! YAY for Harper enjoying the church nursery :) It does get better, something just makes them feel comfortable and then before you know it they will be running into the nursery and not looking back! You're so cute the way you say "ugly comments" - totally what my Granny would say (she is from MS and grew up in Arkansas)! You have a great blog and are a great inspiration to so many of us! Keep up the good work! My mom used to give me Gatorade when I was sick as a kid- the yellow kind. I think I almost wanted to be sick to get that stuff; now, it'd probably make me sick to even smell it! Hope you're feeling better! i have a tiny little blog with pretty much my family as my readers, but one day i got a mean comment -i cannot imagine how much worse it is on a more visited blog like yours. i'm so sorry :( and boo on the sickies too...i hope you are both on the mend soon and that miss harper avoids it altogether! and i did not attend obu but did go to a tiny little christian school in texas (lubbock christian university) and i LOVED it. there is something really special about a small school. Aww, I hope you and Scott feel better soon. And I'll pray that Harper stays healthy! Kelly, I think that little outfit Harper has on is so adorable. You dress her so girlie and I love it! I went back and read the ugly comments from yesterday and I just wanted to say I'm sorry that someone said those things. You handled it well. Harper is precious and beautiful and a gift from God. i seriously do not understand the nasty comments. i guess that's just the ugliness of the world. so sorry to hear that you and Scott aren't feeling well. I hope you are better soon and I will pray that Harper doesn't get it!! Hope ya'll feel better soon!! Sorry to hear you and your husband are sick. Praying you both get to feeling better soon and little Miss Harper does not get it either. Yeah, for her doing so well in the nursery today!!! I wish people were not so mean. Unfortunately it seems to me being anonymous on the internet has made mean people more comfortable being nasty. They say hateful things they would never say out loud to someone's face. While I know they are simply insecure and jealous, and don't have any better coping skills than to lash out, I'm sure that doesn't make it any easier to read. Get well soon! So sorry you guys are sick. Hope you guys feel better soon and Harper is so precious! I've been reading you blog for awhile now, but have never commented before today. Sorry about the nasty comments (I love the little "delete" button...works wonders). I know it doesn't feel good, but keep doing what's best for your family and ignore the negative input! One day, I hope to have a little girl so I can put her in cute little dresses and big bows too! Love your attitude, keep your eyes toward the "prize"-Jesus, that is! 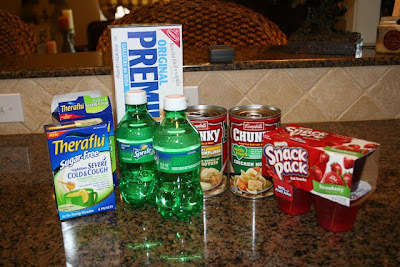 Ahh yes... theraflu and chicken soup... you will be feeling better in no time! Adorable pictures!! Good for you, Kelly! I'd turn off anonymous comments too to avoid comments that are mean spirited. I'll never understand why people feel the need to comment on blogs if they don't like what people say... just don't read. It's a mystery! I seriously don't understand why someone would leave nasty grams on there for you. I smile everytime I come here. Feel better, all of you! I hope you guys starting feeling better! I know the feeling I was sick for 3 weeks. That little Harper is too cute! Get well soon!! Sorry for the negative comments; I think your blog is great and like my momma said and sometimes I say it to my own kiddos...If you can't say something nice don't say it at all!!!!! Hey Kelly! Hope you guys feel better. That chicken noodle soup and jello sure will help! :) I am a new reader of your blog, and I am enjoying it! I received a Restoration Hardward catalogue and they have a new bedroom/bathroom collection called Child and Baby. I have to tell you...I thought of Harper and I told my husband, "Oh, Kelly would love these bed linens!" They have the cutest brown/pink color scheme, with polka dots and all kinds of pretty designs. Just wanted to let you know:) God bless! Jesus made Harper just the way HE wanted her to be; six toes and all... no yikes!!! was not a mistake or a surprise on His part! Also, the same Jesus who made her with 6 toes healed her when she was born... why would you even say something so terrible about that precious baby! And lastly, just because harper was in the nicu doesn't mean kelly should not look presentable i am not sure why you think kelly's looks have anything to do with harpers condition. she is not a doctor or nurse she could not physically do anything to save her life but pray and you can do that while you dry your hair and put make up on!!!! Thanks! So sorry kelly people have to be so rude! It just hurts me to think people would leave such ugly comments about you and your precious family. Seeing your posts everyday are such a joy to me. Hope y'all start feeling better soon. You're always in my prayers. As I read the comments yesterday, I seriously thought did some of these people not ever learn that if you can't say anything nice just don't say anything at all! Ugh! On the other hand it was fun to see all the other OBUer's out there in the blogworld! Hope you and Scott get to feeling better! I hope you guys feel better soon! I read your blog all the time, have commented once or twice, but had to comment today about your turning off anonymous comments. I am so sorry that people are so ugly to such a sweet person. They just don't know the joy in life they are missing when they choose to live on the mean side, instead of "choosing" to enjoy the good things around us. You are easily someone that a lot of us could envy, which would lead to bitterness and ugliness or we can choose to look at you and enjoy the many blessings God has given you. My husband was laid off from his job of 13 years in 2008 and one day I found myself beginning to feel bitter at those around me who had jobs. I had to stop and say, "Whoa, horsey." I don't want to get down in that. I belong to God and if I am in the unemployment line, it is because He allowed me to be so. Didn't Job say, "Those He slay me, yet will I trust in Him . . " Job 13:15 and it also says "The steps of a [good] man are ordered by the LORD: and he delighteth in his way." Psalms 37:23 He orders the steps of His children. So instead, I focused on the good things and enjoy life so much more, even in the middle of unemployment. I am sorry for those that are ugly to you because they don't realize what they are missing by not enjoying such a cheerful blog. 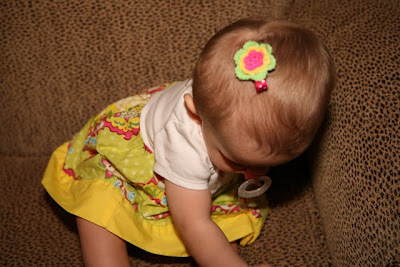 I love seeing which hairbow Harper will have on next. They always make me smile. God bless you Kelly and thank you for being a sunny spot when life is hard. Monogramming must be a southern thing because my children have EVERYTHING with their initials!!! I read the anon comments, people are just jeoulous.....and that is not a good thing to be! Hey Kelly! I love love love your blog! Harper is adorable! I get so many ideas for recipes and decorating from you and I am also encouraged in my walk with God. I am so sorry that people are rude and ugly. It hurt me just to read some of the comments. Please know that people are very jealous and bitter and want to lash out and hurt others. Please don't stop posting or shut down your blog. It is just so hard to understand why some people feel the need to be so critical and leave ugly comments. It seems simple, just don't read the blog if you don't like it. It frustrates me and I am just the reader. Thanks for always being authentic with your posts. I hope you all get to feeling better soon! Sorry your not feeling well! I never dreamed someone would write such things. Please ignore these sad people and keep on posting! Oh it makes me so mad when people post mean things like that! You are so sweet, and I'm glad you don't let it bother you. Just always try to remember the people love you and think the world of you! I'll be praying that Harper stays healthy! So sorry that you all are feeling under the weather, its never fun to come back from a great vacation only to get sick. BUT, the sweet thing is that you get to comfort each other, hope you get to feeling better soon. I'm sorry you're not feeling well and I hope y'all feel better soon. And congrats on Harper doing good in the nursery. That's great news. I'm sorry that some people left you hateful comments. I normally don't comment on blogs, but that annoyed me so much that people would do that, I just had to say something. I cannot imagine having so much extra time that I would read blogs that I didn't enjoy, one anonoymous blogger had obviously been reading your blog since Harper was born, and then to wait for you to open up the anonymous comments so they could say something hateful? Who has that amount of time and energy to be so ugly? It's really sad. I absolutely love reading your blog and I'm glad that there's so many people out there that feel the same way and that leave you postive comments. I'm glad you don't have anonymous postings. I can't understand why people think they can leave ugly comments ~ if you can't say something nice...! GET WELL SOON wishes coming your way! =] L.
Anyone who gets up and gets presentable every day knows it can be done in under 40 minutes-every girl needs to take the time to do that for herself, most of the time, no matter WHAT is going on!!! Lazy people! So you looked good at the hospital-good for you! It kind of amazes me-that comment. I know people can be mean, but REALLY? Wow. Oh no!!! Get well soon! I have had sick children the last TWO weeks. I am praying that I don't get sick...who would do the laundry?! Hi Kelly I know you said your not good at answering questions that come from comments. But I thought I'd take a shot at it since you took your email down for awhile. 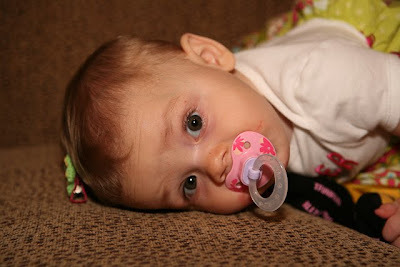 I saw Harper's pacifier with the flowers on it and I would love to get one for my little girl. Where did you find them? Thanks! Love your blog! Goodness, I don't know why people say ugly and mean things. Who knows, but I just wanted to let you know I just adore your blog! You rock, Kelly! Hope you all feel better! Ditto the reaction to the uglies of the world...but I wonder about all the folks who keep saying they wish they had a blog...I hate they don't know how easy (and free) it is to set one up. Kelly, I am so sorry people left mean comments. That makes me SO mad!! I absolutely cannot stand it when people are mean. I am fired up after reading that and realize that I just need to pray for those people even though it goes against my flesh. You are wonderful and a great witness to thousands!! God is using you and your blog! Praying for you...and also praying for the bullies. But, since I don't live in the South, I will just continue to read your blog and root for the Buckeyes! You should just click on my blog real quick to see my little Buckeye! You are a woman after my own heart when it comes to dressing little girls. Seriously, why do people have to be so mean? If they don't agree or want to hear what you have to say, why read your blog? I hear you about the Anonymous commenters... I learned the hard way myself at the beginning of the year so I shut them down.... GRRRR! I've not really gone back to blogging after it. Anyhoo... I sure do hope that you and your sweet family get to feeling better. I love your blog, Kelly! I am so sorry about the horrible anonymous posts. It really is awful that people could intentionally hurt others and we will all have to answer to God for our actions here on earth. (((hugs))) I hope you all feel better and that Harper stays healthy! Hi Kelly, I just caught up with your earlier post and wanted to reveal my lurkiness. I live in NC and work in a NICU as an NP, so I was especially interested in Harper's start in life. I like reading your blog because you seem honest and forthright with your opinions. I can tell that you are smart and I admire how you handle yourself. My daughter just joined a sorority ( tri delt) and all I know about sororities is what I have read on your blog. Anyhow, I hope you and your husband feel better soon. I hope all of you are feeling better! Harper is just too cute! Kelly- I read some of those comments and they are just tasteless! People can sign up for a blogger account and be able to leave comments, it's free and easy! I'm so sorry you had to read those comments- Harper is beautiful, heck- every woman and child is beautiful no matter what "imperfections" people try to force on them. God made Harper just the way she was intended to be made! Hold your child dear and let those words fall off your back! Here we go! Trying to not be so lurkerish anymore with the blogs I like to read! :) I hope you guys feel better! Hopefully it wasn't a bug..maybe just worn down or allergy related? In any event I hope the cold and flu season stays away a little bit longer! And I too had to be nosy and read some of the anonymous comments. People are just dying to get under other people's skin!!! What is with that? Not nice! Hi Kelly! I hope and pray y'all feel better soon! Hey Kelly! I love your blog & Harper is too cute! You must tell us which etsy shopper you bought her white dress from? I have a 7 month old son, but when I have a girl I want to have a dress like that for her. i left a comment another time (it was like #500 so you probably didn't catch it!!!) about me having a daughter next feb. we will be naming her harper.... so if you plan on selling your harper's things please let me know! hoope y'all feel better! can't believe those anonymous comments! seriously, why do people feel the need to be sooo nasty?! Who has time for negativity and nasty comments! I agree---if people dn't agree---then go to a different blog! I personally love looking at your blog---you are so NORMAL! I think a lot of us can relate---just taking each day as it comes, not really sure of this whole "mommy" thing---but doing the best we can and loving every minute of it!!! Love your blog! Hope you all start feeling better soon. You should try the Red, White and Blue Bom Pops. Shawn always got those for me and they always made me feel better. Hoping that you and Scott feel better soon and that Harper does not get sick too!! I will be praying for you all to start feeling better and for Miss Harper to not get sick either! I will also be praying for whomever doesn't have love in their heart to not leave anything but nice comments... so sad!! I've been reading your blog for a long while now. I've said this to you before, you are a blessing! Those mean people need to find a mean people blog to read. I love reading your blog everyday! Shame on the persons who leave negative comments. You have a way of letting us see your personality and I think you are just one really sweet girl. You have a beautiful family! Don't ever change~ stay "just you"
Am I missing the super nasty comments? Were they deleted? Or were you just that offended that someone didn't like Harper's bows? Or maybe I am not good at reading between the lines? Either way, don't let it get you down. Hope everyone gets to feeling better.. PS.. love the chunky soup! People said mean things to YOU?! OMgosh...I am so sorry! Who on earth wouldn't like you!?!? That's just plain craziness! Can I just say you are AWESOME.. please keep the anonymous comments from coming in.. those rude comments were uncalled for. Thank you for your blog that literally gloryfies the Lord every time you write! Hope you feel better soon!! You are such an inspiration to so many people, myself included. I guess some people's momma never taught them, that if they don't have anything nice to say, don't say anything at all. I can't wait to have my own little girl someday. I have liked the name Harper for a long time, and you have made me love it even more. I've only been married 3 months though, so we are gonna wait a little bit for kids. Holy moly--I didn't read any of the nasty comments, but I guess I am just dumb enough to believe that people do such things. WHY would you read a blog you can't find anything good about? I can't fathom taking the time to write an ugly comment--move on people! Oh boo--sorry to hear you are under the weather--it's been a rough start for me this September too! You take care of yourself and your family! Hope everyone gets to feeling better soon! Just wanted to thank you for your blog and for sharing your life and your heart with your readers! So many times when I get down about being a single girl I visit your page because you are just so inspiring. Harper is beautiful and you are a terrific mom. Wow....I saw a few comments on your last post from good ol' "Anonymous". Some people are just jerks. So glad you turned off that feature. I think most anyone with a blog has experienced getting smacked by the "anonymous" blog trolls! Hi! I don't comment much... but I just for the life of me don't understand why people choose to read blogs if they don't like them! How cowardly to leave a nasty comment anonymously. Anyways, sorry it happened to you! Hope you all get to feeling better soon!! Oh, do NOT make me go all BonQuiQui on mean commenters because I WILL DO IT IN A HEARTBEAT IF THEY MESS WITH YOU. But in love, of course. Hope you all are feeling better soon. Be careful and pay close attention to the symptons, I'd hate to see one of you get the swine flu. Dr. Oz had a good piece about it on his show today, check his website for more info. sorry you're not feeling well then having to deal with bad comments...what is the matter with people?! Lifting up prayers right now! Job 19:25-27 For I know that my redeemer liveth, and that he shall stand at the latter day upon the earth: And though after my skin worms destroy this body, yet in my flesh shall I see God: Whom I shall see for myself, and mine eyes shall behold, and not another; though my reins be consumed within me. Oh Kelly. I definitely feel the need to comment today. I think it's just awful and so disappointing that people are leaving you hurtful comments. When I think of things like that, it reminds me of something my mom use to say to me when I was little, "They're just jealous." Unfortunately, years later and with three little ones of my own, I've found that there are still so many broken people out there who get their kicks our of saying hurtful things. I happen to find your blog, your story, and your message inspiring, uplifting, and truthful. I think children are a gift from God and they ome in all sorts of packages. If you choose for your precious package to be dolled up with a large bow, then that is entirely YOUR decision and I say, what an adorable package she is! Keep up the awesome work that you are doing my dear. Great is your reward. What's that saying..."shake the dust off your boots and go on..." it's biblical obviously but I'm misquoting it :) clearly God has gifted you with hospitality and that's why so many people feel drawn to you. And we all know what evil wants for those who God is working through. So sorry that you've had some nastiness thrown your way but here's hoping the Lord is reaching them soon...Likely through you! Yes those negative anonymous comments are no fun. Oh no! I hope you and Scott get feeling better and I hope sweet Harper doesn't get sick. I am so glad she had such a wonderful night sleeping and a wonderful day in the nursery! I know it will make leaving her so much easier. This sounds like house! I hope you guys get to feeling better! We will say a prayer for you guys tonight! Way to take a stand! I love what you have to say! And I am with you, if you don't like it, don't read it. you are such a blessing to me and a definate bright spot in my day. 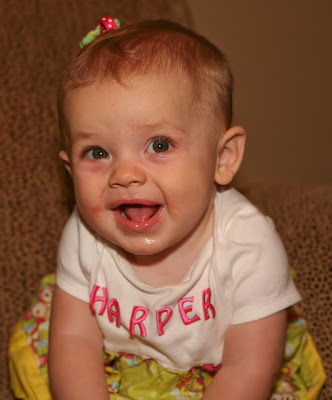 Your sweet Harper is just abnormally cute...what a beauty! What a sweet and classy way to handle rude comments. I hope you all feel better. Hope you feel better soon! I just went back and read some of your posts from when Harper was born and boy can I identify! I think your blog is great. You and your family are just beautiful! Hope you feel better and Harper doesn't come down with it. Prayers of protection on their way. We LOVE your blog. This is our first time to post on your blog but we have been reading it since right after Harper was born. My husband and I just got married July 18 and were wondering if we wanted to have kids. You and Harper have made us realize how much we want to have kids and can't wait until the day God blesses us with a little one just like Harper. Thank you so much for showing me that I too can be a mother. You express your doubt and fears about motherhood and it just gives me faith that God will guide me as well. My husband and I love reading your blog together at night and we just wanted to thank you for being such a strong Christian blogger. We hope God continues to bless you and your beautiful family! PS we are hope ya'll feel better!! Sorry you had some bad comments, but MANY of us LOVE you!! Hope you wake up tomorrow feeling MUCH better!! I do wish you and Scott a speedy recovery. Since we girls live in the same neck of the woods, I know that junk is going around and my entire family was down with it a couple of weeks ago. Good thing is, it doesn't stick around too long. Take care, girl and feel better soon. Hi Kelly, I haven't posted before and my blog isn't even up yet, but I just had to post after reading about the nasty remarks in your comments section. Having a 12-month-old little girl of my own, I look forward to and enjoy reading your blog. I just wanted you to know you and little Harper are just precious! I would have probably written something not so nice if someone left me a negative comment, but you have such integrity and grace, you handled it perfectly. Enjoy your little Harper, she's a cutie! Yeah to sleep! So happy for ya'll. I remember those days. Keep posting, Kelly! Your blog is loads of fun.. people will do anything to make themselves feel better. God must be using you for an awesome purpose if Satan is that strongly on the attack! You are inspiring so many people, many without a faith in our Lord, so post away!! : ) We will all keep coming back to hear your sweet words. I just found your blog and I have really enjoyed ready about Harper. She is adorable! My friend told me about your blog since I have been looking for ideas for my daughters first birthday party. I definitely found some neat ideas from your readers! Kelly, I cannot imagine anyone saying anything negative about your blog. It is always uplifting, funny, sometimes heart wrenching, but so, so wonderful. I guess some people have just gone to the dark side. The Pro-Kelly commenters far outweigh the Anti's. Maybe they are jealous, or just doing the devil's work. Don't apologize to them, just keep on doing what you're doing. You have done a world of Good for so many readers. I hope you and Scott feel better and that Harper doesn't get sick and have her surgery cancelled. Will be checking to see how she is doing on Thurs. Say a prayer if you have time, my Grandson has swine flu. I hope you get better soon and Harper does not get sick! People must have way too much time on their hands to leave anonymous comments that are awful! I don't get to read any blogs daily, but yours is reallly a blessing and great Kelly! Harper is darling! I pray you all get to feeling better soon! She (he) who has nothing to hide - hides nothing! All you can do is pray for them. They are right in one way - Jesus DOES love them even though they have hate in their heart. Hope that you and Scott feel better real soon. I also hope that Harper doesn't get sick. Kelly, I just want you to know what an inspiration you are to so many people. God sent you here online because He knew this was a great avenue for you to reach out to many, many people. I am one of those people. Thank you for all you do. Oh no! Hope you all get to feeling better. I love how genuine you are and your dear family as well (and your extended fam)... .. I'm not from the South and have never had much tolerance for pigs, but GIRL! when I saw that picture of you teaching Harper to say, "SOOEI" I thought it was downright charming! Oh my!!! How could anyone leave YOU rude comments. Your blog is one of the most inspirational and adorable things ever!! I hope your family gets to feeling better VERY soon! It seem that the "crud" is going around everywhere. By the way, I love Harper's outfit. Monogramming is one of my favorite accessories to Charli Beth's outfits ;o) haha! I don't blame you for not allowing negative comments. So many people love your blog and are inspired by it (I'm one of them!) I can't imagine why anyone would say anything negative to you, but don't worry about them! Keep on blogging girl! I'm convinced that rude comments are from people that are jealous and don't know how else to deal with their feelings. Like, seriously? If they feel the need to leave nasty comments, why even read your blog?? I don't understand. I love your blog, Kelli! It's encouraging and funny and cute, and well, just fun! Hoping and praying yall get to feeling better asap! Take care! Sorry for the fools that leave rude comments. I don't get it at all. Kelly- You and I could not be more different... We share such different beliefs, & are at different points in our lives. But I still love to read your blog, and I would never have anything negative to say about you, or your precious baby for that matter. I just don't understand people sometimes, they can be so hateful for the strangest reasons. No matter where you go in life there will be people that dislike you for no reason....just be reassured how many friends and family and blog friends really love you, and that's all that matters. AND...don't worry about those who hate you... they hated Jesus first! Youre in good company. I can't imagine why anyone would feel the need to leave an ugly comment. It must be plain old jealousy. Your blog is one of my favorite reads! I hope everyone is feeling good today. I am so sorry you had negative comments written. You are just so fun and inspiring and there are so many of us who think your blog is just the best to read. Kelly, I think you are just precious, and a wonderful young woman of God - a great mother and wife. I don't understand what in the world people would be saying that would negative or hateful. They just wish they had your joy. Keep up your great blog posts and transparency. I am so inspired by your authenticity. Have a great day! I hope you and Scott feel better. I am so sorry a few bad comments have to ruin it for everyone, it is such a shame. I had a few very negative people leave comments when I was going through infertility pretty much telling me to give up or that we were never going to have a healthy baby. Nice!!!! It hurt just to see that in writing, but I deleted them and moved on. So sorry people have to be that way, you are the sweetest girl I know and my favorite blogger for that matter. Keep your chin up and try not to let them get to you. Take care! Hope you all feel better! And I know you don't need anyone to comment on the RUDE anonymous commenters but seriously??? What is wrong with people. I guess some people only find joy in saying ugly things to or about others. Obviously this person has issues. Thanks for always being real. Love your blog! You and your family are precious! Reading your blog has made me realize how blessed we are to have our health. God is good! I don't think I have ever posted but I will say, I don't cry easily but that story about the dress and the lady praying over it makes me sob! I am 12 weeks pregnant and very emotional! Ha! If your precious family is ever in Nashville, we would love to meet yall!! We go to First Baptist in Nashville and have so much in common! We are HUGE Ole Miss fans, so thanks so much for Coach Nutt! Well, I think that your blog is just wonderful. You radiate kindness and positivity and in our world, we NEED that. I hope you and your husband feel better and that Harper stays healthy. It's hard when you are not feeling well and you have a little one to care for as well. I hope you all feel better soon! Harper is so cute! I cannot think why anyone would leave you bad comments. Oh well, just ignore them. Hope you both are feeling much better. Praying for your entire family this week. So sorry you are feeling bad. So glad, though, that Harper is doing better in the nursery and sleeping more! YIPEE! :) Love the outfit and bow in today's pic. Praying that you both feel better today! Hope your house is well very soon! I can't believe that someone could post hateful comments to somebody who just oozes sunshine! I read your blog every day but I've never commented. I don't ever know what to say! I enjoy reading your blog very much. Hope you have a good day! I am thankful for forgiveness. We love you Kelly!! I can't believe someone could send YOU hateful comments! So I'll be the like 160th person to say it - people can be stupid. When you commented about that person leaving a rude remark I actually went back to look for it because it was hard to believe! I'd like to just stick up for you on the particular comment I came across and state that when your child is in the hospital sometimes its all you can do to look good in the morning. You have to have some kind of normality to your day and if you don't take care of yourself and look like it the doctors will send you away to go snag some sleep or something. If you've never had someone special to you in the hospital you can't understand this and shouldn't go out of your way to be hateful to someone that is sweet and kind to anyone and that's made quite obvious by her current 4986 followers and countless "lurkers"
Kelly -- I've followed your blog for a few months, ever since my friend Helen Joy started blogging "show us where you live." I love seeing all the cute outfits on Harper and I love telling my husband about all the insane stuff everyone posts like their high school pictures and such. I wish I could give you a hug and tell you to ignore people that are just angry and jealous and hateful, but I know that doesn't make it any better. I hope you and your hunny feel better soon!! It is rainy in Tennessee this morning. A good day to stay in jammies and read a good book. So happy for you that Harper went into the nursery without crying! Enjoy your Bible study! I love in-depth Bible studies! Hope you guys get to feeling better soon! Pray that Harper stays well! It has been raining here all week --I am ready for some sunshine! I really enjoy your blog-thanks for sharing it! Have a wonderful day! I love reading your blog and hearing about Harper. I hate to hear that you received negative comments. I don't understand why women (and maybe men) have become so judgmental when it comes to the blogging world. Reading blogs is a form of entertainment/relaxment for me that I like to do in my free time. If I didn't enjoy reading your blog, I wouldn't and that would be the end of it. There is not a need to be mean and cruel. I just shake my head at mean people - life is too short to run down other people! Kelly, I can't imagine someone not liking you...you are precious! What Bible Study are you doing? We just started Beth Moore's Esther study! I'm looking forward to it! Hope yall feel better! Half of my house is home sick today as well! Sorry Kelly! My son didn't sign himself out...Grrr!!! You don't have a stalker named Garet! I am so sorry that people leave mean comments. They shouldn't read your blog and look at your cute pictures if they don't like it. I love your blog...it's one of my favorites! just wanted to say that i am so glad that you are able to look past those mean comments! and continue to do so! keep your anonymous blocker on and just realize that it is a trick from the enemy! you are doing a wonderful work of God with your blog and being so transparent and Christ honoring! keep on keeping on and don't let that mess stop you! harper is a doll and i do love reading your blog!! !